A few days ago, I picked up a book about slow barbecuing. The book had been sitting on a dining room bookshelf for quite some time, having been brought home by my husband, a man with a deep interest in all varieties of meat preparation and consumption. After glancing at the cover of the book for several weeks, I finally became curious as to what this book might offer in the way of secret insider barbecuing information, and sat down with the book with the intention of studying it. Side note: Many years ago, I was convinced that every single book I started, I also had to finish. No matter if I was enjoying the book or not, I felt, for reasons I am still unable to explain, compelled to slog through even the most boring and intolerable of books. This went on for ages, until a coworker of mine happened to one day recommend to me a novel that involved cross-country travel on a bicycle, something in which I was, and still happen to be, interested. So I started the book. To get to the gist of what happened, I am going to edit out the slow and torturous ordeal of reading this book, and just tell you that, after all those years of practice of finishing books I did not enjoy, this particular book was so awful, so condescending in tone, and so ridiculous in character, that I, for the first time, was driven to not finish a book. In fact, I not only didn’t finish that book, but I believe I may have, at one point, released an unpleasant and hearty groan as I chucked the book across the room and away from the earnest and somewhat tedious insistence of my prying eyes to keep chipping away at the book. Aside from the part about rocketing the book away from my body, my reaction to that novel was pretty much a precursor to the reaction I had to reading the barbecuing book. Why? Why must people insist on making cooking into something that is inaccessible? Why must cookbook writers look down upon their readers, and insist that their way, the intense, unbending way, is the only way? Shouldn’t cooking be something that invites readers to share in a recipe? Shouldn’t cooking be inspiring instead of belittling? If you tell people, Mr. Barbecue Author, that the only way to make “real” barbecue is to buy a special smoker, only use lump charcoal, and never never use a gas grill while trying to make delicious barbecue, do you really think you are going to ignite a fire under people to go out and attempt your recipes? And do you really think that I am going to read that, bend to your will, and forgo the 8 years of service that my gas grill has duly provided, just so I can tell people that I made barbecue the “right” way? As you may have surmised, no, I did not follow the barking orders of Mr. Barbecue and his insufferable tome. Instead, when hit by the urge to make smoked ribs for a small Independence Day celebration, I consulted with three different books about barbecuing that offered guidance and helpful tips, developed my own recipe based on flavors I thought would be interesting, then utilized a number of different barbecuing ideas that I thought would be a good fit. And guess what? The ribs, after four hours of smoking on a gas grill, with wood chips left to smolder in both a small smoking box and a makeshift smoking pouch made of aluminum foil, and helmed by a person with absolutely zero previous experience dealing with ribs or rub, came out beautifully caramelized and tender. The flavor of the rub, while subtle, provided an unexpected undertone to the smoky taste of the ribs, and, even though I broke every single rule that was dutifully laid out for me by the world’s most detestable barbecuing guide, my gas grill-smoked ribs still triumphantly emerged lightly tinged with a telltale pink smoke ring on the outside edges. Combine mustard seeds and fenugreek seeds in a spice grinder or mortal and pestle and grind until a fine powder has been formed. 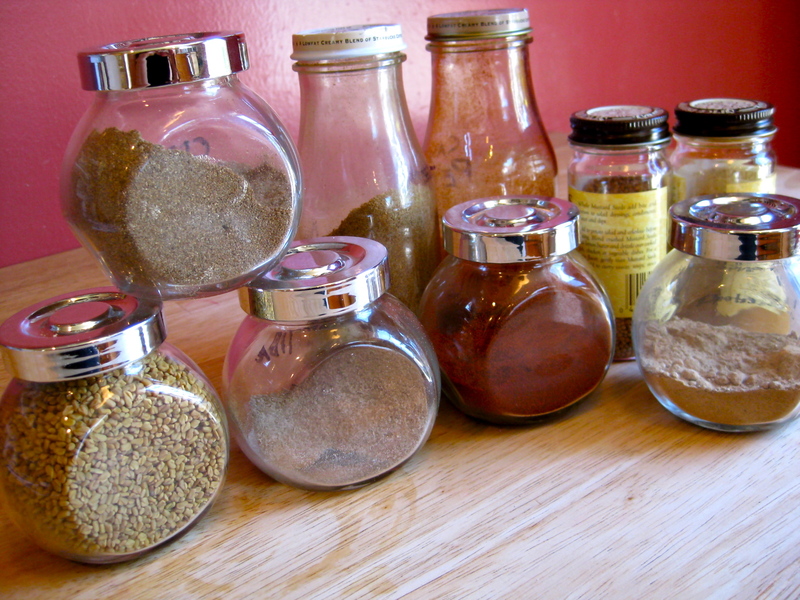 In a small bowl, combine ground mustard seeds and ground fenugreek seeds with other spices. Mix to combine. Rinse ribs, then pat dry. Place ribs in a large, flat dish, or on a baking sheet that will fit into your refrigerator. 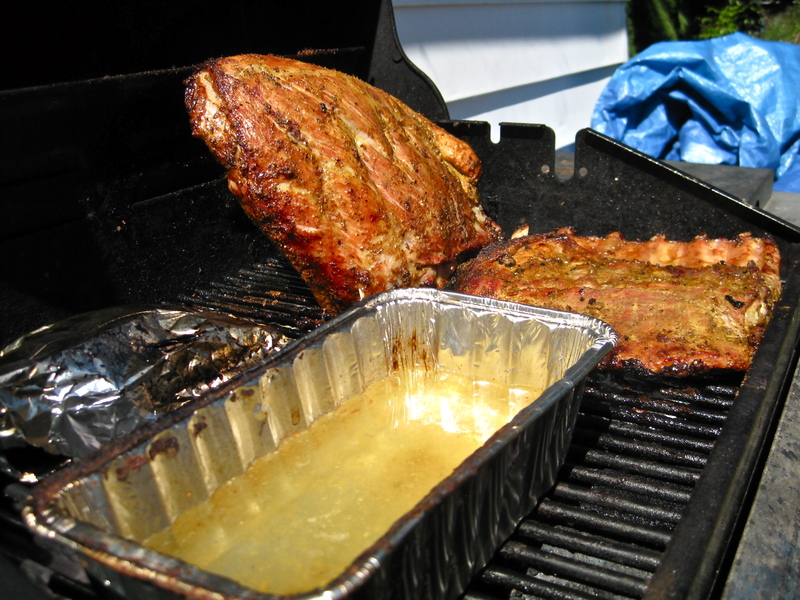 Brush both sides of your ribs with a light layer of yellow mustard (this will help your spice rub adhere to the ribs, and will also aid in the formation of a nice crust on the meat). Sprinkle spice mixture over both sides of rubs, very gently patting into the meat (try not to pat too hard, however, or the rub will just stick onto your hands and pull off of the meat). 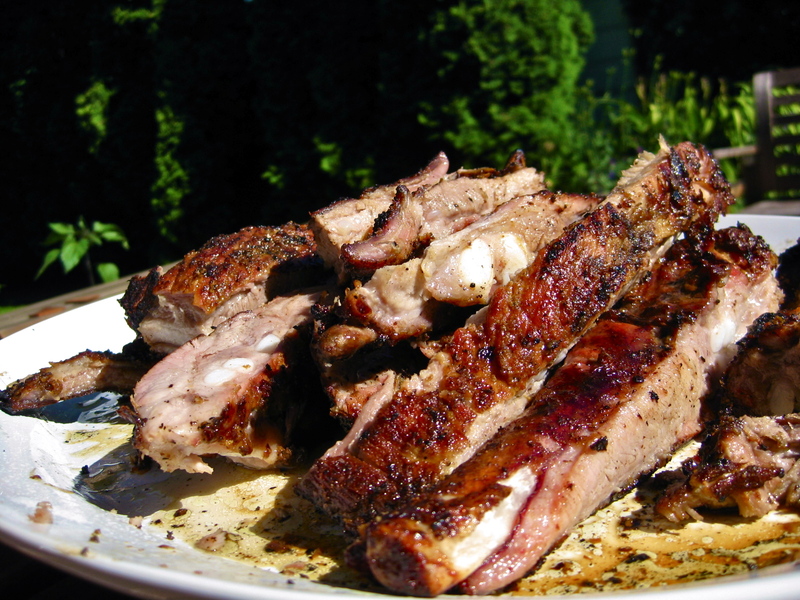 Place spiced ribs in the refrigerator to rest for at least 4 hours, preferably overnight. At least 30 minutes before you are ready to cook your ribs, remove them from the refrigerator and allow them to come to room temperature. Set up your grill for indirect grilling. If you have a two burner gas grill, this will mean setting one burner on medium low heat and leaving the other burner off. If you have a three burner gas grill, it will mean setting two burners on medium low heat and leaving the third burner off. If you have a charcoal grill, you will be raking your hot coals into two piles on opposite sides of the grill, leaving an empty space in between. After preparing whichever grill you have, place a drip pan in the portion of the grill that is not lit or covered with hot coals. Note: you can read more about direct vs. indirect grilling here. 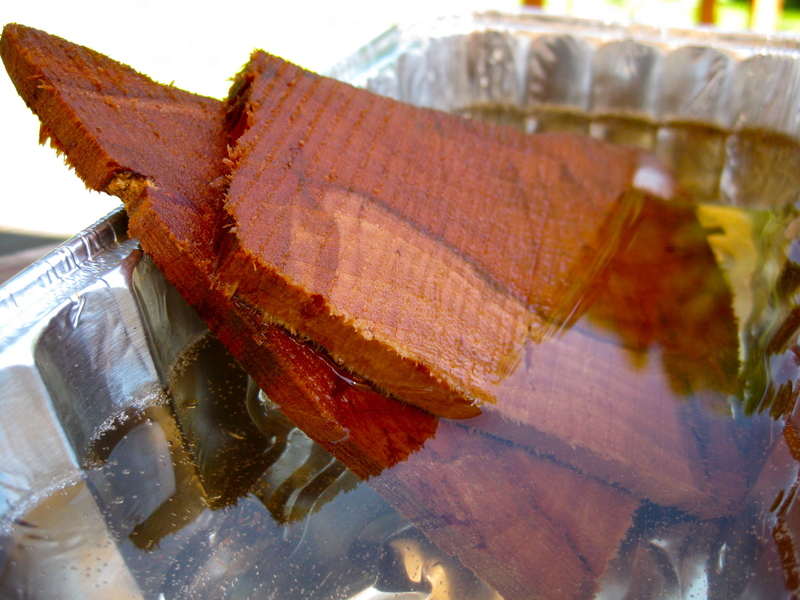 Toss the pre-soaked wood chips onto hot coals (if using a charcoal grill), or, if using a gas grill, place wood chips in a smoker box made specifically for gas grills (such as this one), or wrap your wood chips in a tight pouch of aluminum foil with holes punched in the top (as demonstrated here), then place the box or pouch of wood chips under the grill grate, directly on top of a burner. I ended up using both a smoker box placed under a grill grate and a foil pouch smoker placed on top of the grill grate. Place a small pan of water, filled ¾ full, on the heated side of the grill. Pour apple cider into a small spray bottle. 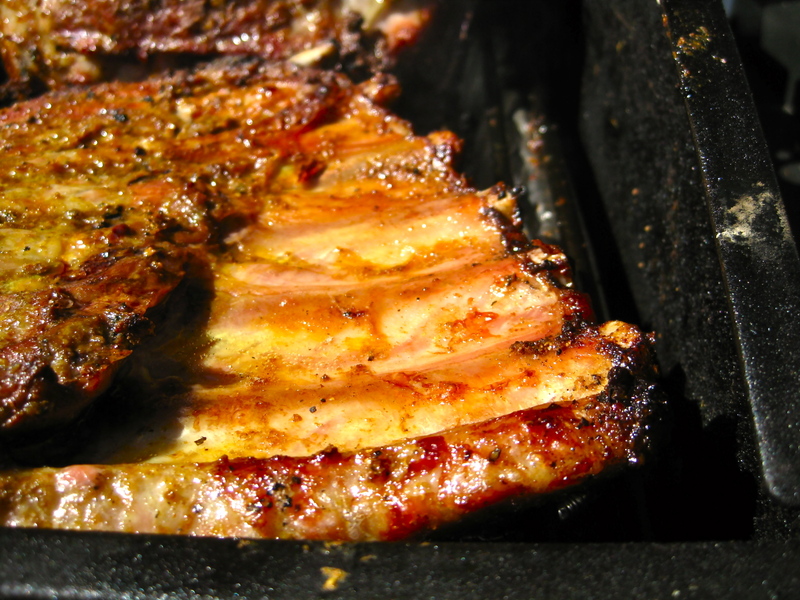 Place the ribs, meaty side up, on the hot grate, over the drip pan that has been placed away from the heat. If your ribs do not fit flat on the grill, as ours did not, place one slab flat, and the other on its end, propped up on the wall of the grill, if necessary. Lightly spray ribs with apple cider. Close lid of grill and allow ribs to smoke for at least 3 to 4 hours on medium low heat (if you have a grill thermometer, the temperature will read somewhere between 200 degrees Fahrenheit and 250 degrees Fahrenheit, though do not rely entirely on your grill’s thermometer, since many things can influence an incorrect temperature reading—our grill was sitting in a sunny place and the temperature read between 350 and 400 degrees the whole time, which was obviously incorrect). 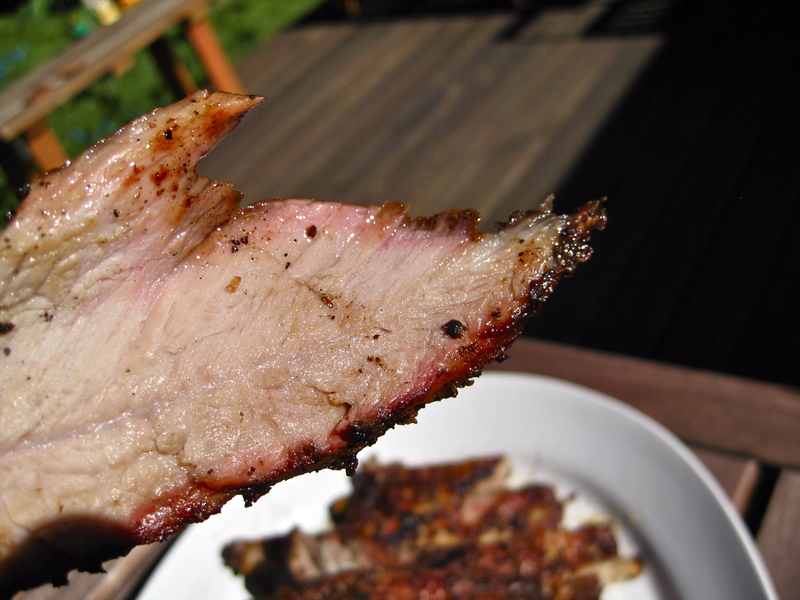 Every 30 minutes, open the grill, turn your ribs over, spritz them with apple cider, then close the lid of the grill. If the water in the pan has reduced a great deal, replenish the water about ¾ of the way full. 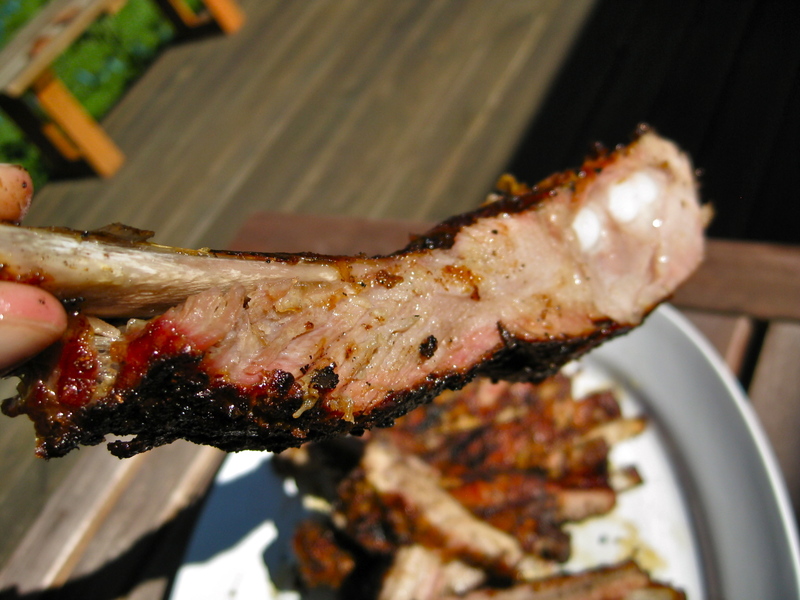 You will know your meat is done with the meat has started to shrink back about ¼ of an inch from the ends of the rib bones, and a fork is able to easily penetrate the meat. We smoked a heavy five pounds of meat and, with repeated spritzings of apple cider, the ribs took just shy of 4 hours to cook.